Dead letters piling up. Do you find it challenging to clean them manually? Let us consider a scenario, where you have messages dead-lettered. Over the period the dead-letters get piled up in a few numbers or at times in hundreds or thousands every day due to some business or application conditions. It may be a routine for one of your operators to clean up dead letters every day. There is no automatic clean-up of the DLQ. Messages remain in the DLQ until you explicitly retrieve them from the DLQ and call Complete() on the dead-letter message. These activities are usually done manually using a custom-built application or using Service Bus Explorer – a tool available in the community. The dead-letters are processed either as a single message or handled in bulk. 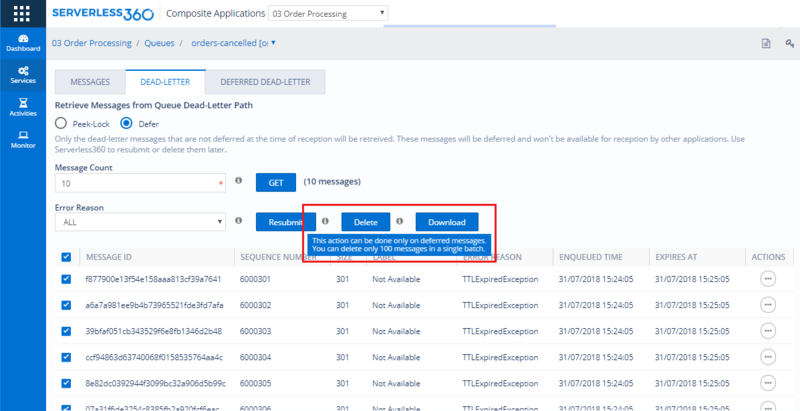 With Serverless360, it is easy to clean up your dead letters individually or as a bulk. Your operator can retrieve a message from Dead letter queue and then decide to delete it. If the message must be analysed for details before it is deleted, it may demand manual operation. In certain cases, messages that are dead-lettered for some obvious reasons can be processed without manual intervention. In other words, automating this at some specific time in a day will save lot of efforts from your operator. For e.g: A operator can configure an activity to clean all messages that are dead-lettered due to Time to Live (TTL) expired exception. This activity can be scheduled to be processed close to mid night every day. This saved activity configuration can be triggered manually at any time irrespective of the schedule as per the operator's requirement.